In our latest series of blog posts, we will be providing you with a number of delicious and healthy Budwig recipes that you can use on a daily basis. 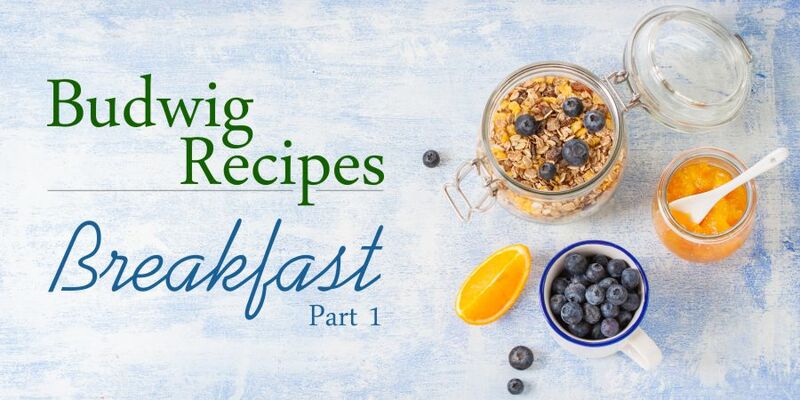 Today, we are starting off with some simple Budwig breakfast recipes for you to try. IMPORTANT: Blend in a blender until no oil is visible. Normally fruit should be eaten all on its own and not combined with any other foods. Fruit passes through the stomach in about 10 minutes whereas other foods take much longer. When the fruit is mixed with other foods it has a tendency to ferment and causes stomach bloating and gas. This is not healthy. Here are some options of what you can put into the Muesli, which the kids will like too! A teaspoon of organic cocoa, a few drops of vanilla flavored liquid stevia, then add some walnuts. It tastes like chocolate pudding with nuts. Most Granola sold in the stores contains sugar and other ingredients that are not healthy. Here is a nice homemade Granola recipe that all the family can enjoy. Mix well and add the oil, honey, vanilla, and salt to dry ingredients. Let cool and serve with Oat Milk. Combine the oats, milk in a saucepan. Bring to a boil. Cook about 1 minute over medium heat, stirring occasionally. Remove from heat. Add the vanilla, cinnamon, and honey. Stir in the flax oil. 1-2 tbsp (15 to 30 ml) of either or all of the following oils, cold pressed sunflower seed oil, flaxseed or organic coconut oil. Blend in your regular blender or with a hand blender for 30 seconds to a minute on full power, serve and enjoy. Thank you for this observation Jared. Hopefully this will help ones in your area find the best ingredients to prepare this recipe. What would the alternative be for people with lactose intolerance ? What flax seed oil is recommended – and with or without lignans? Hello there, I live in Malaga Spain and I can’t find the equivalent of cottage cheese in Spanish, can you help? In Málaga you can find quark in Carrefour, in Corte Ingles, a Speissequark with 0,2% fat in Aldi and a requeson in Mercadona. Hope that helps. Hello Debra, both types of oils are good but lignans are found in the ground flaxseeds so if you will be including the ground flaxseeds when preparing this recipe, you would not need to have the oil with lignans. Thank you Petra. We are not actually encouraging our readers to add Granola and porridge to the muesli. This blog offers separate recipe options for breakfast, hence the title: Breakfasts. So there are options to eat different things for breakfast if one doesn’t have the Budwig muesli in the morning. We know that some use a whisk or a fork to mix in the quark with flaxseed oil but the most effective way to get the mixture homogenous is with a hand blender. Thank you for your suggestion though. WHEY: This could be a very good replacement. The SOLGAR Cold Filtered brand is a good choice. You need much less Whey, in fact 2 tablespoons of Whey to 3 Tablespoons of Flaxseed is the ratio. We recommend you mix with presoaked flaxseeds. Soak 3 tablespoons of flaxseed or better still 2 tablespoons of flaxseeds and 1 tablespoon of Chia seeds (see information on Chia seeds at the end of this report) for at least 4 hours. Then mix with a stick blender the presoaked seeds with 1 tablespoon of Whey powder. My wife had breast cancer 6 years ago. She immediately started on the Budwig Protocol, using Nancy’s low-fat, organic cottage cheese which she gets at Whole Foods. Every year she is tested for the possibility of cancer reoccurrence, and every year she tests the lowest of anyone the doctor tests. Thank you Dr. Budwig and Thank you God. Thank you Jerry for sharing this testimonial with our readers! How encouraging! Cottage cheese is loded with Sodium ..salt deterates cells in the body ,,,importantly, infection with Helicobacter pylori bacteria also damages the stomach lining, and is made worse in the presence of “salt”. Helicobacter pylori infection is relatively common in parts of Asia and is also an independent cause of stomach cancer. What about diets high in salt that don’t include these foods? Use 6 tablespoons of Presoaked flaxseed and instead of adding them to cottage cheese add the presoaked seeds that you blend with the upright stick blender to 6 level tablespoons of cold filtered whey powder instead of the cottage cheese. Consume this twice a day so you will need 12 tablespoons of presoaked seeds and 12 level tablespoons of whey. Plain Whey is the best choice. SOLGAR and Dr. Mercola sell a cold filtered whey which is the best. Add the honey of per recipe. Hope this works better for you. What do you suggest if you have allergies to corn, soy, wheat, dairy, and eggs? These recipes sound wonderful but am trying to figure out how to adapt them. I also have been eating almond yogurt lately. Would that be a good replacement for the cottage cheese or dairy products? Avoiding the foods in your list are a good start to a healthy diet actually. Instead of dairy can you handle oat flour, rice flour or buckwheat flour? DAIRY INTOLERANT: If you are intolerant to dairy then use 6 tablespoons of “Presoaked flaxseed” approach and instead of adding them to cottage cheese add the presoaked seeds that you grind up with the upright stick blender to 6 level tablespoons of cold filtered whey powder instead of the cottage cheese. Consume this twice a day so you will need 12 tablespoons of presoaked seeds and 12 level tablespoons of whey. Plain Whey is the best choice. SOLGAR and Dr. Mercola sell a cold filtered whey which is the best. Add the honey of per recipe above, but leave out the skim milk. If the whey still bothers, use simply consume up to 5 tablespoons of presoaked and/or freshly ground flaxseeds per day throughout the day. Add the presoaked seeds to your smoothies, juices and freshly dry ground seeds to your cereals and sprinkle over your salads. People that cannot take any dairy often need to detoxify the liver and restore enzymes and healthy bacteria to their gut. I like your Granola recipe – can I use extra virgin cold pressed coconut oil instead of Sunflower seed oil? Another question is that I have been adding organic lemon juice to the muesli I make both for the morning and noon – is that permitted in Budwig Protocol? Thank you for your suggestions, yes, lemon juice can be added if you like it and coconut oil instead of sunflower is ok too. I have been suffering with acid reflux and gerd for years. I have tried many things to cure it naturally and not successfully. I am thinking completely to switch to Budwig diet for some time. Can this diet help me with my problem? What food do you recommend to eat and what not to cure my acid reflux. I also saw in your shop that you sell Stomacalm. Can I benefit from it? Thank you for contacting us with this question. For digestive problems it is recommended to try a vegetarian diet and yes, the Budwig diet would be good as you would consume only natural food. Remember to eat the food that is hardest to digest for breakfast and lunch only. For dinner choose a veggie soup, rice with steamed veggies or a piece of fruit. Nothing too difficult to digest. Also, don’t dilute your stomach acids with water or drinks. Don’t drink 30 minutes before a meal and wait 1 hour after the meal to have a drink. Stomacalm is certainly a good idea for someone like you. Is it possible to make a cottage cheese with skimmed powdered milk and natural lime or lemon juice, because I can’t get the cottage cheese where I reside. Can I substitute the flaxseed oil with grinded flaxseed. Thank you for sending us this question. We are not experts in the recipe for actually making the cottage cheese. We buy the one we use here at the clinic. Please search online for a recipe that can help you there. To substitute the flaxseed oil with the ground seeds, here are the instructions: Put 12 tablespoons of organic flaxseeds into a bowl and triple the amount pure water to cover the seeds and then soak overnight. Using an upright stick type electric blender, grind and blend up half the amount of soaked seeds (you need to consume the muesli twice a day thus the other half of presoaked seeds will be used in the afternoon) and then add to 6 tablespoons of low fat (2% of less) cottage cheese or quark, 3 tablespoons of low fat milk (avoid UHT milk) and blend with electric stick type blender for a minute. Could you substitute avocado for the cottage cheese? Thank you for sending us this question but that would not be an option. Avocado is a fruit with fat, yes, but not the same protein as the cottage cheese. The fat in this mixture is the omega 3 in the flaxseed oil. Hi,can Budwig diet treat Chron’s disease? I have substituted the cottage cheese with kefir for my dad. Would love to know your thoughts on this? Thanking you in advance. Is Flax seed meal Powder useful or harmful for Glaucoma/AMD patients? Where can I find quark cheese in Belgrade, Republic of Serbia? I’ve recently turned Vegan and feel so much better for it. Thank you so much for all your amazing work! I am lactose intolerant and was wondering if lactaid cottage cheese can be used instead. I find the low-fat cottage cheese/flax oil to taste just fine. Today for first time I added organic cocoa+unfiltered honey (Stevia is TOO sweet for me). I’ll have to head back to store for more oil and cottage cheese. I do plan to try the Granola, Porridge and Moose next week. I am trying desperately to come up with a theme and sponsors to get me to the clinic. I’ve now been struck 15 times by cancer. If it means cashing out my term life insurance to get there, I’ll do that. I had round 1 of chemo and NEVER EVER have I experienced anything like I did this time: extremely sore throat, steroid for throat shot blood sugar 265. Today while shopping for cottage cheese was tired which is unusual. If I do not find a way to Malaga, then there’s no other solution to this disease for me personally! Sorry for the lengthy comment! You can add many different foods to the Budwig Muesli but only after you have made the basic mix first with the honey, milk, cottage cheese and flaxseed oil. Most people find this product in the cheese section of their supermarket. We hope you are able to find one that has no more than 2% fat. If you don’t find quark, maybe you find cottag cheese. Dear Bessa, sorry for the delay. yes, this would be good. Just remember to get one with fat content no more than 2%. Dear Bruce, sorry for the delay in replying. Certainly we agree that a vega diet is healthy and apart from the quark or cottage cheese, Dr. Budwig did not encourage her patients to have any other animal protein or fat. When one blends the flaxseed oil until homoegenous with the low-fat quark or cottage cheese, it changes chemically and does not have the same effect in our body. But for ones who prefer not to have this mixture, taking Cordyceps (a mushroom extract) has proven helpful, as well as using whey protein blended with soaked flaxseeds. We recommend grinding the flaxseeds each time you are going to eat them. If they are ground up ahead of time there is risk of them going rancid or that something is added to them that isn’t natural to prevent this from happening. Dear Richie, Sorry for the delay in replying. How has he been feeling with this substitute? Kefir doesn’t have the same amount of protein as quark or cottage cheese and the success of the mixture is getting the right proportions of oil and protein. Can you use quark or cottage cheese to blend with the oil and then add kefir after? Is it okay to mix ginger with the cottage cheese mixture? I just want to make sure that it won’t interfere in any way with the Budwig protocol. Sure, any healthy ingredient can be added as a 2nd step after the mixture has become homogenous. If I cannot find organic cottage cheese in my city can I substitute with organic yogurt or should I use not organic cottage cheese? Do you have to add the ground flaxseed to the flaxseed oil and cottage cheese mixture? I have been using the Budwig mixture for awhile now. I don’t mind the flaxseed oil and cottage cheese, but the extra ground flaxseed makes it harder to eat for me. I cannot seem to download the Budwig Guide. I want to start the Budwig oil protein diet right away as my CT Scan said suspicion of Renal cell carcinoma in my right kidney. Mrs Tindel it seems, uses Nancys low-fat organic cottage cheese successfully, we do have that brand in our area. What are your thoughts on using this as Quark? It is better to consume quark/flax seed oil on its own or can I have a bowl of porridge with it? Dear Karl, since it is something you will be eating regularly, possibly daily, variety is necessary so go ahead and add it to other healthy foods like porridge. As for health benefits, it will be equally beneficial if you are able to continue doing it regularly and the quark flaxseed oil portion is blended as a 1st step before adding it to other healthy food. Dear Jane, have you signed up for our newsletters? You should receive the link to download the guide then. As for the cottage cheese you mention, if you are able to find something like that, yes, that would replace the quark. Dear Archie, yes, honey is healthy when it is raw, as is not pasteurized. You can add it to some foods like a home made salad dressing or to the Budwig muesli. but are they acceptable for the above? Flaxseeds is certainly advisable for these types of cancer but we still test individually when a patient is able to come for a Vega test and GSR scan. I know fruit is more difficult to digest with other foods but it tastes so good with my budwig muesli that I add it as well as the ground flaxseeds and 1 tablespoon of apricot kernels . Is this OK? I don’t have any trouble digesting this. I don’t eat in the mornings until about 11 am; however it does really fill me up and I couldn’t possibly eat more than one other meal in a day. My fiance’ has colorectal cancer spread to brain, lung and liver. We are currently at a clinic in Mexico and the cancer has not grown since we are here but there has been no improvement either. I am thinking of having him start of the Budwig protocol but I know that some of the therapies and supplements he is taking are not recommended in conjunction with the cottage cheese/flaxseed oil mix. So perhaps we should wait till we finish here? Have you seen a lot of people with metastasized colorectal cancer get better using the protocol? Other question: the ground flaxseeds should not be used for colorectal patients. So, should I add an extra tablespoon of flaxseed oil instead? Should I get oil with lignan since we won’t be using the seeds? Please help. My wife has triple negative breast cancer and we have started the budwig protocol. My question instead of low fat milk can we use Almond Milk? 1) What is the best time to eat the muesli – for breakfast, for lunch or for dinner? 2) When is it ok/best to drink, before or after the muesli? and how long before or how soon after? 3) How soon after the muesli can one eat the other food? I read in one answer above that it is actually fine to eat the muesli with porridge, so this question seems answered, but still? 4) Is it OK to use flax seed oil which has a shelf life of 1 year and a slightly bitter taste? She’s been able to buy only this type of flax seed oil locally. Or is it better to replace it with flax seeds? 5) Coffee – should one try to absolutely abstain from coffee? Coffee has been part of my mom’s food habits for long.